Most WISP’s I have found are self-taught which I can appreciate because I too have taught myself many things. However, when you get formal training, training created by the manufacturer it’s like a light comes on and you suddenly are able to make the gear do everything it is capable of. That’s when training pays for itself. EMAIL US about private classes or CLICK HERE to get notified by email about our next class! Classes are taught using a hands-on, practical approach by Steve Discher, an experienced MikroTik certified instructor and consultant and author of RouterOS by Example. We will prepare you for the certification exam and deliver tons of useful, practical information you can take back and implement on your network. Objectives: By the end of this training session, the student will be familiar with RouterOS software and RouterBoard products. He will also be able to configure, manage, do basic troubleshooting of a MikroTik router and provide basic services to clients. Target Audience: Network engineers, administrators, and technicians. Prerequisites: Basic computer skills and technical ability. Objectives: By the end of this training session, the student will be familiar with static routing, VPN’s, PtP addressing and dynamic routing using OSPF. Target Audience: Advanced network engineers and administrators. 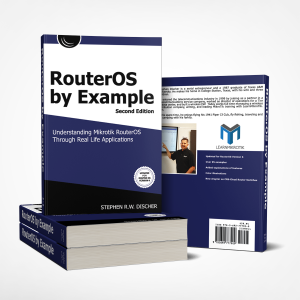 Prerequisites: MTCNA and proficient using RouterOS features learned in the MTCNA. Objectives: By the end of this training session, the student will be familiar with all wireless capabilities of RouterOS including theory, protocols, PTP and PtMP links, routed links, bridging, meshing and the NV2 protocol. Target Audience: Network engineers and administrators. Prerequisites: MTCNA and reasonable experience using RouterOS. Objectives: By the end of this training session, the student will be familiar with building advanced RouterOS firewalls, the packet flow diagram, traffic shaping, QOS, DHCP and web proxy. MikroTik administered tests are given the last day of class so you can get your MikroTik. Basic, MTCNA (MikroTik Certified Network Associate) or advanced certification including MTCWE, MTCRE, MTCTCE, or MTCUME. Classes range from a few days to a week, depending on the course. Classes include labs where you will configure routers and build networks. Lecture all of the material in the MikroTik official certification class materials plus much more content added by me based on subjects students ask for most. Theory will be combined with practical application so you will retain what you learn. You will need your own laptop, everything else is provided. Classes include labs where you will configure routers and build networks. The lecture will cover all of the material in the MikroTik official certification class materials plus much more content added by me based on subjects students ask for most. Theory will be combined with practical application so you will retain what you learn. You will need your own laptop, everything else is provided.